There aren’t many things better in the world of food than halloumi (in fact, the world in general). With its salty crispness and squeaky texture, it makes a ridiculously delicious little snack all on its own but is also one of my absolute favourite salad ingredients. 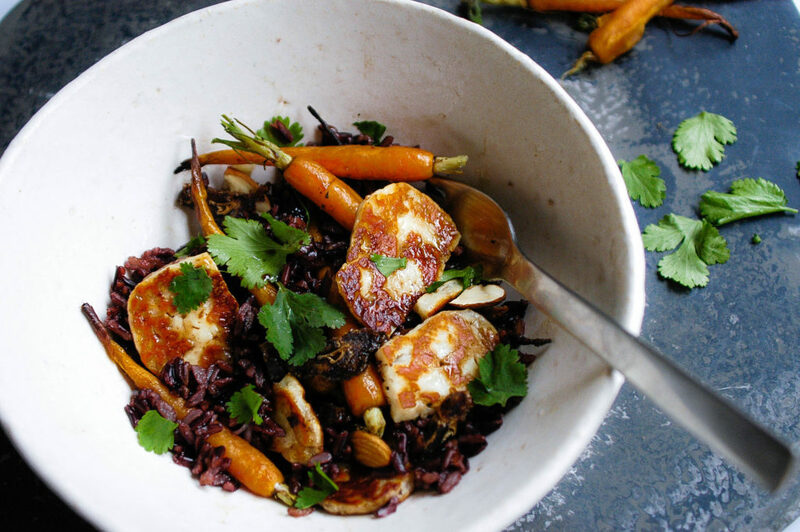 Unlike most other cheeses, halloumi has a high melting point which means it doesn’t lose its shape when its fried or grilled (which it definitely should be as this is when it really works its magic!). The one thing that is better than haloumi though is halloumi paired with something a little bit sweet, like honey or fresh or dried fruit (in Cyprus they eat it with watermelon!). Just to make sure I’ve got all bases covered, I’ve used both honey and dates in this salad along with some nuts for a little crunch and black rice for no reason other than it just looks really beautiful (but also contains the antioxidant anthocyanin which gives it its dark purple colour, bonus!). It’s filling enough to be a meal on it’s own but would also be a great starter or delicious as side to go with lamb. Place rice in a medium sized saucepan with 1 1/2 cups of water and bring to the boil. Reduce heat and simmer, covered, for around 30 minutes or until soft and almost all water has been absorbed. Meanwhile, spread carrots and nuts on an oven tray and roast for 10 minutes. Spread nuts over tray and bake for a further 5 minutes or until carrots are soft and browned on the ends and nuts are golden. Heat a fry pan over medium heat and fry halloumi pieces on each side until golden brown. To make dressing, stir all ingredients together in a small bowl until well combined. 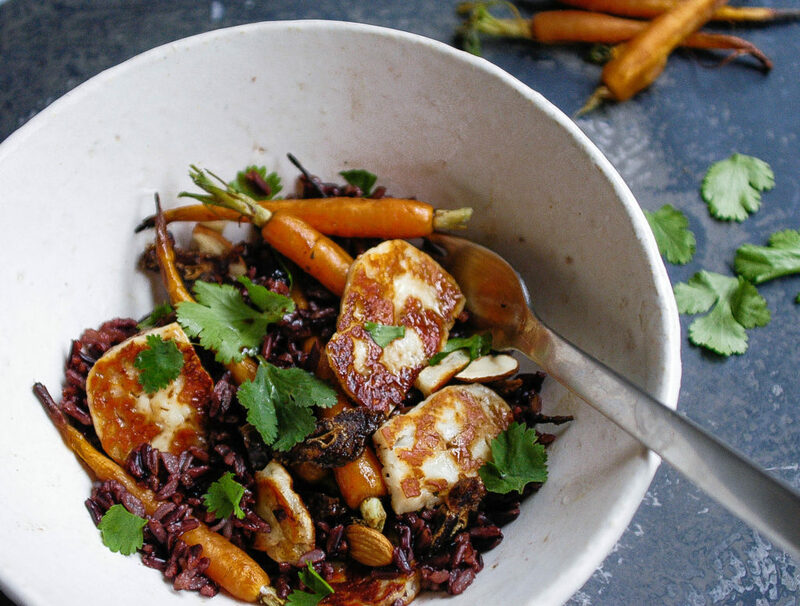 Place rice, carrots, halloumi, nuts, herbs and dressing in a large bowl and toss together.